The average motor home is nearly three feet wider than the average car. If you’re used to positioning yourself in the center of the road when driving, you may find your motor home crossing the the right line because of its greater width. Veering too far to the right is one of the most common problems experienced by new motor home drivers. Fortunately, the fix is easy. Simply practice driving closer to the center line in your automobile. Instead of centering yourself in the road, get in the habit of positioning the driver’s seat somewhere in the left half of your lane. Before long, driving that way becomes second nature. Once in the motor home, adjust the lower convex mirrors so that about a quarter of the mirror’s surface shows the side of your rig. With the mirrors positioned properly, you can see where you are on the road from the driver’s seat. Check often to assure you’re driving between the lines and not drifting. When making turns, the back wheels don’t follow directly in the path of the front ones; they take a shortcut. With long vehicles, like RVs, the difference can be meaningful. If turns are not negotiated properly the back tires clip curbs and the middle section of the RV can swing into objects. To prevent this, identify the objects you want to avoid hitting (curbs, street signs, cars, puppy dogs) and drive straight until your hips are past them. Only then crank the wheel in the direction you want to turn. As you turn, keep an eye on the side mirrors to make sure you’re middle and back wheels don’t hit anything. If it gets close, straighten the wheel out some and continue past the obstructions. 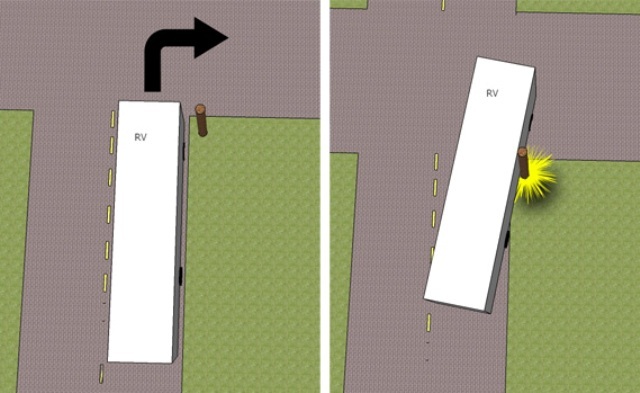 In some cases, when turns are especially tight, you may need to swing a little in the opposite direction first to give the RV a wider turning radius. Go slow and use your turning signals to let everyone else on the road know what you’re doing. While the middle of the RV swings in the same direction the frontend is turning, the back swings the opposite way. How much depends on how far the RV overhangs its back wheels. This is especially important to remember when pulling out of places with nearby obstructions and requiring tight turns: like gas stations and parking spots. If there are objects close to your RV opposite from the direction you want to turn, try to drive straight forward until the back end clears those objects. Alternatively, turn slowly while keeping a careful eye on those objects in your side mirrors. The idea is to take wide, rather than sharp turns. Before pulling into a spot always consider how you’re going to get back out. If leaving requires sharp turns, be sure the rig has enough room for both the swing of the back end in one direction and the sweep of the middle in the other. Heavy vehicles take longer to stop than lighter ones. How long depends on a lot of things, but driving speed is a major factor, and one that you control. Slow down. You’ll save money on gas as a reward. Increase your following distance too. The best way to avoid accidents is to maintain long distances between yourself and everyone else on the road. A benefit of driving more slowly is that you’ll notice space naturally opens up in front of you as other drivers race off to whatever is so terribly important. Before changing lanes, check your mirrors and rearview monitor, if you have one. Engage your turn signal. Check your mirrors a second time. Then slowly move into the new lane. Give everyone else on the road enough warning and time to react to what you’re doing. You may have blind spots, but everyone can see you. Use that to your advantage. In my experience, driving a large motorhome is far easier than I ever imagined. If you can drive a car and you appreciate the differences in how a large vehicle handles, you should have no trouble at all. Just go slow and give all potential hazards plenty of space. Back in the day when they had hood ornaments on cars they were used to gauge your right side clearance. You use the center post on the windshield and line it up with the right lane marker. There are products sold that are used for judging right side clearance if you have a one piece windshield or have difficulty seeing at night. As far a tail swing, check out all the barked up trees were RV’s roost at night. Most of it isn’t from turning to to tight. The people that drive these things and don’t know how to use their mirrors is scary! Yup, the new rigs (like ours) have no hood ornaments or divider to the windshield. You can use a grease pen to mark a center spot, and also mark where the front end vanishing point is. I haven’t found a need to do that, but I can see how it might be useful. I’ve heard if you always make a left turn (go around the block) you have more room to negotiate the turns. Works in city traffic. Enjoy your articles! We are newbies with a 97 Leisure Travel only 21 feet but I thought it was enormous the first few outings. Now I can’t get enough of the road. Three lefts = one right, LOL! That’s doable, and maybe preferable in some circumstances, but I sure wouldn’t want to do that as a rule.